After hearing such touching words on two continents from my father and uncles, the sons, and just now my mom, I speak today on behalf of all of the grandchildren – Eitan, Gadi, Alex, Elie, Yoni, Yael, Ari, Yaffa, Yonina, Ora, Simi – and their respective spouses. I have the unique privilege of having turned Esther and Al Klein from Mommy and Daddy into Grandma and Grandpa; I hope to represent my generation honorably. My grandmother died after doing what she said she would do, which is to attend my cousin Eitan’s wedding, last Sunday night, to his lovely bride, Pam. My brother Elie took Grandma down the aisle. She danced with her children, all but one of her grandchildren (me), and about half of her great grandchildren. She danced with the children and grandchildren of her surviving brothers, Joe and Shalom. Early Wednesday morning, she began slipping into the next world. This was with the full knowledge that all three of her sons were still in the country, and could be around her in the final hours. She liked to tell of how *her* grandmother, who died of the rarest of all things in her generation – natural causes – slipped away after lighting candles Friday night. After two days asleep, struggling quietly with death, it seemed that my grandma could not let go. So the sons and daughters-in-law had the idea to make Kabbalat Shabbat around her bed a little early, on Friday morning. This is when she agreed to go. Esther Klein did things on her terms. She accepted God’s will. But to the greatest possible extent, it would be God’s… and Esther’s. If funerals were given to creative staging, I would invite you to my kitchen for a fitting tribute to this great lady. I would seat you in the corner on a rickety step stool, play some swing music, and let you peel some potatoes for my soup, or very slowly add the ground nuts into the egg whites for the highest rising Pesach cake in Bayswater, if not all of Queens. If you were male, I would also probably get you to schlep something up from where it was stored somewhere terrifying en route to the basement. When you offered to wash dishes, I would joke to you that I had an amazing dishwasher. He was 75 years old and still worked great. While you were on that step stool, I would tell you stories about my childhood and my sisters and my parents, all gone. I would never cry. I would tell you in a way that never scared you or depressed you, but instead compelled you to bring the story forward, to your own kitchens, later. I would sing along with the music and laugh at your jokes, whether or not they were funny, and I would tell you my distinct opinion on family life, world politics, fashion, economics, literature, or social etiquette, all the while agreeing with whatever you just said. “Yeh,” I would say. There was something in what you just said I could agree with. Later, we would play Rumikub and I would scratch your back until you fell asleep. I would tell you stories about your father, when he was little, and how he reminded me in this way of my own father, and in that way, of you. Without too much effort, I would tie you generations back, and tie myself generations forward, completely by the way, as you were dozing off. You would never guess that my own wonderful childhood ended at the train tracks, until I would tell you that part, too. There was a perfect sense that nightmarish evil was absolutely real, and also that, most decisively… Ve Von. We won because, when you are not sitting on that step stool, I am using it, well into my 80’s, to climb to reach things from the top cabinet, teaching you that it’s all about balance. I tell you about my very religious father who learned at the Shabbat table with my mother. How they used to argue about various Rashis in the parasha, back when most European women were learning the Tzena Re’enna. I would tell you about my very learned and religious father who sent his sons to yeshiva and expected them to work, like he did. I would tell you how my mother prepared blueberry jam for stomach ailments, b/c she was known as something of a medicine woman around town, and, like my father’s dry-goods store, her kitchen was a regular stop for the local poor. I would create a seamless flow from Nechama Hershkowitz’s charitable kitchen in Seredna to my short but horrific stay in Auschwitz and then Ravensbruck, where I was sustained by my nieces, Ibby and Helen, teenagers of whom my sisters put me in charge… and then right back to the kitchen where we now sit, making potato soup. Which, if I were my grandmother, would bring me back to my mother, who told me on our first day in Auschwitz, when we were being processed into our potato sacks, to ignore the SS, just as I had ignored the goats and the cows back home. My mother had reminded me, in those two weeks we were together before she disappeared in a cloud over Poland, who was the human being in this situation, and what that demanded of me. I remembered, and reminded, every day since. What it meant to be human was to have balance. Empathy and a sense of justice. Respect for the dead and a total dedication to the living. To living. A sense of reverence and a sense of humor. Balance. Living modestly but mindful of aesthetics. A dedication and deep gratitude to America, and a complete devotion to and support of Israel. Work outside the home well into her 70’s, and family always first. Being equal parts emotional, intellectual, and physical. Shiurim, survivor’s meetings, family events, the gym. Shul and the Beach, both healing. Being realistic and optimistic – living on that delicate edge of facing down yesterday and expecting a reversal tomorrow, while completely in the present, today. My Grandma was Zen before anyone knew what that was, except maybe my Uncle Normie. My grandmother’s life, you would soon see, was a “Dayenu” story. Thankful and disbelieving of every victory, and also always pushing the envelope toward the next one, the one that her father demanded that she pursue. I could go on forever, making very appropriate comparisons to Queen Esther and to Sara Imeinu from the Parasha – matriarchs who themselves represent dynasties and disasters, Jewish advocacy, relentless optimism alongside realism, and gentle, iron strength in the face of the patriarchy and other nuisances….but it is late. So I will suffice with the story that many of you have heard, but some of you have not, and it bears repeating, mostly because it taught me a lot about what is running through my veins, and that of my cousins, and now all our kids. It was the endless winter that began 1945. My grandmother and her nieces had just been marched through the snow from Auschwitz to Ravensbruck. The Nazis felt that the end was near, and the final solution hadn’t been totally… solved. To accelerate matters, they put the women in an outdoor tent in sub freezing weather. The calculations were correct. Half died the first night there. The survivors, my grandmother told me, slept very little, and when they did, it was standing or sitting, huddled in groups. They also didn’t let go of their tin cups, b/c that way, they could drink hot soup, when it was available. Being and asthmatic since age 13, my grandmother got sick. Very sick. She did the forbidden and fell asleep. She thought she would not wake up. But then something crazy happened. She had a dream. In that dream, her father, whom she had not seen since getting off the train on Shavuot of 1944, was standing near a window in a long white robe. She said it looked like a kittel. He asked her to come look out the window. He pointed actively, like the angels in last week’s Parasha, to a tree with white blossoms, and told her: When the trees start to blossom white, you and Ibby and Helen will be free. Please wait. So she woke up. She stood up. And she waited. And encouraged others to do the same. As her father promised, they were liberated in spring. The Swedish Red Cross took my grandmother and her nieces back to Sweden. When they disembarked this more benevolent train, they found that they had arrived in an orchard in full bloom. On every tree, white flowers. This story, which every grandchild has heard more than once, was Grandma’s way of saying that you need an inner guide, one that is firmly planted in your own authentic roots, but that you make yours, and tell it your way. You need to hang on and believe in God, but you need to do your part to make it so. She believed in Divine miracles made real only via human effort, which is the message of the first Esther, too. She believed in bearing witness to the past, and she believed in writing your own story going forward. Grandma, we will miss you terribly. A world without you is a strange place. But you have taught us how to balance on a rickety step stool while singing and reaching higher. What more could we have asked to know? I feel touched by your grandmother’s life. Yehi zichra baruch. I totally lost it at the back scratching. Well done (as usual). A very fitting tribute. Kol Hakavod, S.
We have a copy of Aunt Esther’s Yad Vashem tape but we junked our VCR. It wouldn’t happen to be accessible on the net would it? Thank you all. Chaim – I don’t think so, but I will check. Also – my uncles working to compile all tapes and dvd’s into one dvd – will let all family know when that happens. This last week I have been thinking a lot about my late grandmothers. Now I read this wonderful piece. Thank you for sharing her story and so sorry for your loss. Such a beautiful tribute to such an amazing woman. Wishing you and the entire family “nechama.” Great great great aunt esther will be missed. I think I’m the first greatnephew-in-law to pay tribute to Aunt Esther on this blog. She really was a remarkable woman, I was zoche to have known her, and enjoy and admire her outstanding personality,her hospitality and her lucidity, even in her advanced age. As you wrote, Sara- she was capable of verbalising her experiences of the horrors of the Holocaust in the past, but at the same time she was totally dedicated to family and community living in the present. What can I say,a special neshama. Amazing. Puts into words everything I was feeling and more. I did hate that basement and the steps. A little while ago (at the age of 34) I went to the basement to get something for her and I was still kinda scared even with the lights on. Although the Peter and the Wolf records she would play for us on Motzei Shabbos scared the bejeebers out of me even more than the basement. Me, Gabi and the kids send our love. I was proud to be a next door neighbor of Mrs. Esther Klien on Bay 28th Street since 1999 until her passing. It was special to me and my children to have a survivor as a neighbor. I saw her sitting by her door the week before she passed enjoying the weather and fresh sunshine we had this November. She was completely aware of who I was and was pleased the prior week when my 8 year old daughter went by. She was warm and loving even when sick and lived each day fully. 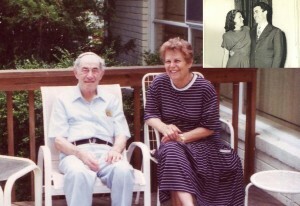 Her approach to the Holocaust was simple – tell it as it was – and she did – I recall one conversation on her porch – where I dared to ask her how she “believed” after the war….so I asked and she told. In summary she told me how it was very difficult after the war…… but when she saw the miracle of her first child – she was strenghtened to a life of belief and observance. For me such a survivor is the lesson of the Holocaust. I was inspired to seeing her alone and saying Tehillim, that voluntary tefilah spoke volumes. One thing I enjoyed was – until well into her 80′s – she would get in her car, sometimes with a friend and sometimes alone – with all of her vigor – and take off to enjoy yet another day alive. It was an uplifting experience casually observing Mrs. Esther Klein over time. I have to end with what is for me the most significant note. I always had a sense that her personal losses from the war and subsequently of her husband OB’M were never far from her heart. With her passing she has come to her well deserved eternal reward and is reunited with her dearly departed family – no doubt a final consolation to her and her loving family she has left behind. Your kindness to her as a family was clearly not lost on her, as a woman of her intelligence she was quiet aware. I am not familair with a more wholesome end to a long life. Her passing in her own home – amongst her family was likely a source of tremendous serenity to her at that time. Thank you so much for this next-door glimpse!!!! !It means a lot to me….I will make sure my family sees. I was very moved by this tribute to your grandmother, as there was much I could relate to… Queens, schleping things up from the basement (especially the Pesach dishes), rumikub, frum grandparents… but most all – my mom (whose company, thank G0d, I still enjoy) is also from Seredna, and was in Auschwitz and marched to Ravensbruck as liberation approached. An interesting path led me to your site, which I thought was going to tell me something about copy writing – boy, was I in for a surprise! And I learned an important lesson about balance, so I thank you very much for this wonderful post.